Best Brick Lane curry house? | WhatPoll? Home > Food & Drink > Best Brick Lane curry house? What is the best curry house on Brick Lane? This road is probably the most famous area in the UK for Indian, Pakistani and Bengal cuisine, with a whole array of curry houses to choose from. If you are local, then this road is great as you can never get truly bored of what is on offer, but if you are new to the area the choice can be pretty daunting. Which curry house should you visit? Generally speaking its best to avoid the curry houses with “touters” outside, offering you complimentary drinks, which is sadly a fairly common site on Brick Lane. For those of you that have dined in this area, vote up your favourite Indian restaurant, or add some more if your most loved curry house is missing! The Aladin is arguably one of the best curry houses in London. The food is tasty, the service is excellent, and the general atmosphere and ambience of the restaurant is great for taking your partner out on a nice romantic date, although if you are going to do that try to tame down on the garlic dishes! 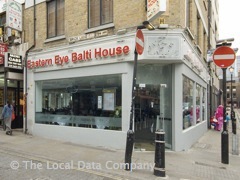 This restaurant was even named by Capital Radio as one of the top 10 curry houses in London. Be sure to check out the King Prawn Biriyani or Haryali Chicken Masala dishes, the latter of which is an Aladin special. Remember to bring your own alcohol though as it is not a fully licensed restaurant! Café Naz is a bit like marmite, some people hate it, others seem to love it! They describe themselves as a “contemporary Bangladeshi restaurant”, and serve up a range of mainly fish and lamb dishes, they also offer a lunchtime buffet menu. Average prices per person are usually in the £25 - £30 range, (depending upon how many beers you order). Some people complain about the quality of the service in this place, mainly surrounding long waiting times for food to turn up. It is not necessarily authentic Bangladeshi or Indian cuisine, but most of the other curry houses on Brick Lane are not either, more “Anglo-Indian” recipes, focusing on Western taste buds. This curry house is more for the fashion conscious Londoner wanting a tasty lunchtime break from work. The Preem and Pritihi restaurants are both run by the same owner, and are very close to each other, at 120 and 124 Brick Lane, respectively. The general consensus of these two curry houses is that they both serve pretty good food, as the menu’s are very similar. They also don’t normally have the dreaded salesmen outside offering free onion bhaji’s and bottles of Cobra beer, which is always a positive! The prawn korma and lamb madras dishes are worth a punt. A must do visit for any Brick Lane connoisseur. The Bengal Village is one of the best curry houses on Brick Lane, they serve up a wide range of dishes, have friendly staff, and offer a selection of special fish dishes such as Keski Mas Bhuna and Bowal Mas Biran, which are both traditional Bangladeshi dishes. Most of the dishes are in the £7 to £10 range so its all pretty well priced, and there are no annoying salesmen outside trying to tempt you in with free popadoms! The interior décor is very welcoming and features nice and spacious tables so you are not cramped in with all the various dishes that get served to the table. Definitely worth a visit. The Eastern Eye Balti House offers a great mixture of Bangladeshi and Indian cuisine, but sadly no Cobra beer, so you will have to make do with Kingfisher - which isn’t the end of the world. The Balti Chicken and Prawn Bindi dishes are worth trying, and always taste pretty fresh too. The service in this restaurant is normally pretty good, and the food normally gets served in a reasonable amount of time. Some Indian restaurants I have been to recently tend to serve up the main course when you still haven’t finished your starter yet, which is both annoying and bad mannered. No major complaints about this great Brick Lane curry house. Tayyabs has a great reputation amongst locals and regulars to the Brick Lane area, having been in business serving up Pakistani food for well over thirty years. It normally has a queue outside on weekends due to its popularity, so its best to book in advance if you are planning to go on a date or something. Although due to its popularity, some people have complained that you get rushed through your dinner somewhat and presented with your bill so that they can seat the next budding diners outside waiting in the queue. Apart from that the food is great and really tasty, especially the naan bread! One of the brick lane must do curry house visits. Nazrul is generally known for having awful décor, fairly average food but at pretty cheap prices. They normally have a guy outside touting for trade, so if you show around late afternoon / evening you will normally get in with freebies like some beer or popadoms. This certainly isn’t the best restaurant in terms of pretentious décor or Michelin quality food, but its great if you are watching the pennies and just want the experience of a Brick Lane curry house. Monsoon is a favourite of veterans to the Brick Lane curry houses, and usually does not fail to disappoint its patrons with great tasting food. Try house specialities such as the Prawn Pasanda or the Mango and Ginger Biryani, both of which are served at very reasonable prices. Just like most curry houses and restaurants in the Brick Lane area, drinks can be a little pricey in the £3.50 to £4.00 range, but this isn’t a great deal more than what you would pay in a pub anyway. Although this restaurant is fully licensed, you can bring your own beer and wine if you like, and they will keep it nice and cold in the fridge until you need it. This restaurant is certainly worth a visit. The Shampan offers a great selection of tandoori dishes and beer. Staff are friendly and the service is normally swift and efficient. The Shampan actually has two sister restaurants, called the Clifton and City Spice, also situated in the Brick Lane area, which are both worth a visit if you have the time. Dishes definitely worth your time and money are the Karai Chicken, Rogon Josh, and Lamb Vindaloo (if your stomach can take it that is). Main courses tend to be in the £5 to £8 range, which is very competitive, but do not generally come with rice, which is not exceptional for an Indian restaurant. The Bengal Cuisine restaurant is a husband and wife run operation, they serve up a variety of popular Indian dishes. The chef’s specials here are great, two worth noting are the Butter Murgi and Khashi Jhalfrazee. This curry house offers a slightly off-beat menu compared to the rest of Brick Lane, which is a great change if you are a frequent visitor to Indian restaurants and fancy something a bit different. Another thing worth noting are the prices, which are all reasonable considering the quality of food and service on offer. Located on Hanbury Street this restaurant does not benefit from the fotfall of Brick Lane... but is constantly full of locals for good reason. I have been coming to Meraz for 5+ years and now won't consider anywhere else. Although it does not look like much from the outside, the food more than compensates. Tandori lamb chops and dried spinach are my two favourite dishes. At < £10 per head and BYOB it is hard to beat from value perspective. The Sheraz is probably the best Bangladeshi / Indian restaurant on Brick Lane. They do not use touts outside the restaurant, very nice and modern clean atmosphere, and the food as I say is excellent. Amazing, this place is always full. Having been to most of the curry houses in brick lane, I got to say papadoms is the best curry house on brick lane. Their award winning dish king prawn malaai is the best, I have water in my mouth even as I am writing about it.